Background: Many surgeons use longer roux limbs in laparoscopic roux-en-Y gastric bypass (LRGB) for more overweight patients in an attempt to achieve greater weight loss. However, prior studies have shown conflicting results regarding the impact of roux length on weight loss. Moreover, gastric bypass produces weight loss through additional mechanisms which are potentially more potent. Our hypothesis is that roux length is not a significant determinant of weight loss after gastric bypass. Methods: We retrospectively analyzed 366 LRGB patients, operated on at a single institution between November 2000 and January 2006, for weight loss two years after surgery. All operations entailed a 40 cm biliopancreatic limb, and varying roux limb lengths: 60 cm (n = 3), 75 cm (n = 29), 90 cm (n = 1), 100 cm (n = 179), 125 cm (n = 36), 130 cm (n = 2), 150 cm (n = 104), and 200 cm (n = 2). The roux length was based partly on the patient’s pre-operative body mass index (BMI). Results: In our study population the average age was 43.9 years, and 87% were women. The average pre-operative BMI was 49.1 kg/m2 (range 34.5 – 82.7). A longer roux limb was associated with a higher pre-operative BMI (Roux length in cm, mean BMI in kg/m2): ( 149, 56.7). Two years after surgery, the mean absolute weight loss (AWL) was 111.7 pounds (range 30 – 253) and mean excess weight loss (EWL) was 79% (range 31.9 – 137). In multivariate analysis, the only predictor of AWL or EWL was starting excess weight. A higher starting excess weight predicted greater AWL but less EWL. In linear regression analysis, controlling for initial excess weight, roux length was not a significant predictor of AWL (p = 0.9) or EWL (p = 0.6). In a subgroup analysis of patients with a pre-operative BMI > 50, roux length was still not a significant predictor of AWL (p = 0.9) or EWL (p = 0.8). Conclusion: We found pre-operative excess weight was associated with both absolute and excess weight loss at two years after gastric bypass. After controlling for pre-operative excess weight, roux limb length did not predict either absolute or excess weight loss. 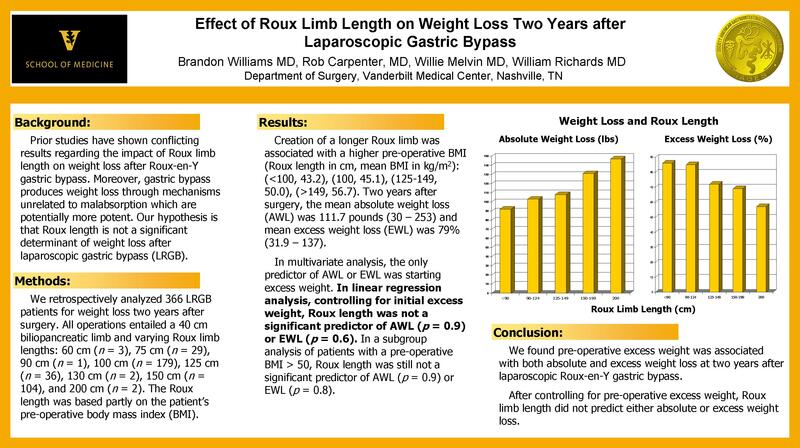 We conclude that roux limb length does not significantly impact weight loss two years after laparoscopic gastric bypass.